After a decent up day yesterday where the Dow Jones and the Nasdaq closed up +0.3% while the S&P 500 edged up +0.1%, futures are higher this morning. European markets opened mixed. Stocks in the United Kingdom and Spain were lower, while markets in Germany, France and Italy posted gains. Stocks in Asia closed mostly higher. Morgan Stanley (MS) will release earnings before the open. E*TRADE (ETFC), Las Vegas Sands (LVS) and Pier 1 Imports (PIR) will follow after the close. Chipmaker Qualcomm (QCOM) closed +23% higher on Tuesday, after it announced it reached a settlement and license agreement with Apple (AAPL) over patents. The U.S. Energy Information Administration will publish a report on crude inventories at 10:30 a.m. ET. The governors of the Bank of England and the Bank of France are set to speak in Paris at 9:00 a.m. ET. Was first added to our watch list early Monday morning. Also, included in the weekend’s Sunday Stock Report. Shares broke out yesterday morning and cleared our posted TRIGGER PRICE of $91.71. The volume on the breakout was running well above +100% or more than twice the normal rate. 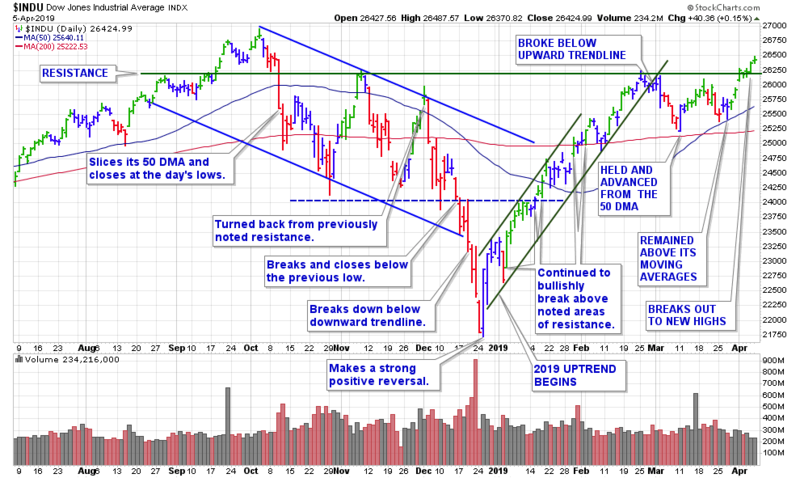 The afternoon’s sharp pullback from the intra-day highs is a serious concern. I am going to put our 1st SUPPORT at the previous highs and the coinciding round-$90. Our 2nd SUPPORT is at the rising 50-day moving average, currently at $85.79. I ran my routine stock screens this morning and added 2 new stocks to our watch lists. 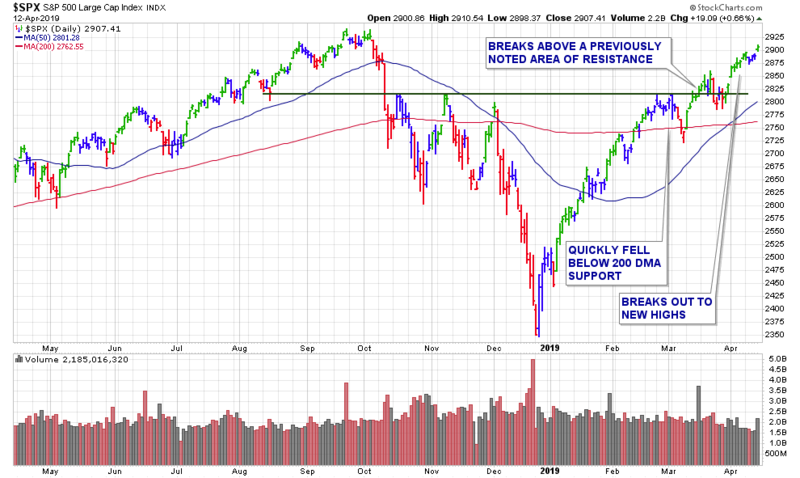 After a quiet day yesterday with the major averages closing with only minor losses, futures are sharply higher this morning as earnings season heats up. Dow Jones futures are currently up +143 points with Bank of America (BAC), BlackRock (BLK), Johnson & Johnson (JNJ), Progressive (PGR) and UnitedHealth (UNH) set to publish earnings before the open. After the close we will hear from (NFLX) and IBM (IBM). 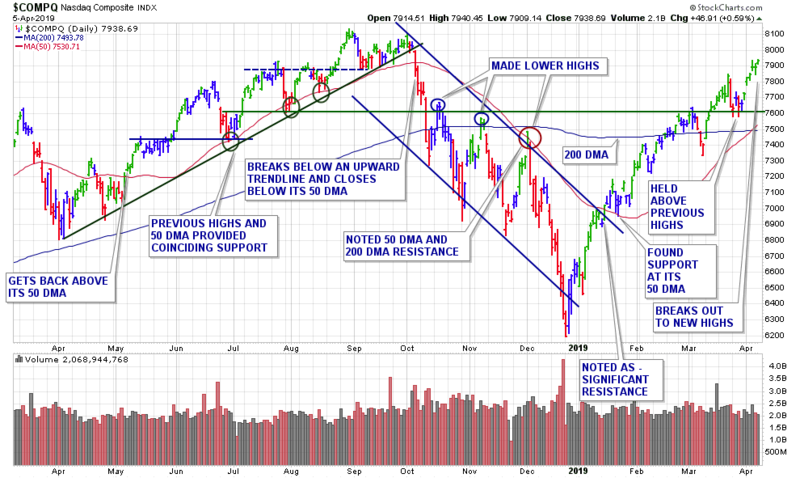 It was a relatively calm, yet decent week on Wall Street with two out of three of the major averages posting weekly gains for a third straight week. We also had earnings season kick off with better-than-expected numbers from JP Morgan and Wells Fargo. After a deep end-of-the-year selloff, the indices are now back near their previous highs. The S&P 500 and Nasdaq are now just -1% away from their respective September and August peaks. The Dow Jones is -2% below its Oct. 3 high. The Dow Jones was the only major index to close lower this past week. The blue chips ended with a -12.69 point loss or down by just -0.05% to 26,412. 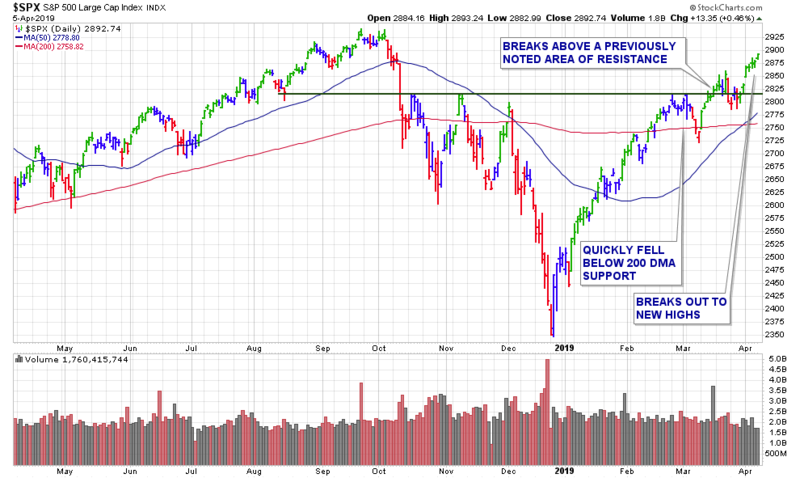 The Nasdaq Composite gained +45.47 points on the week, adding to last week’s +0.6% advance. 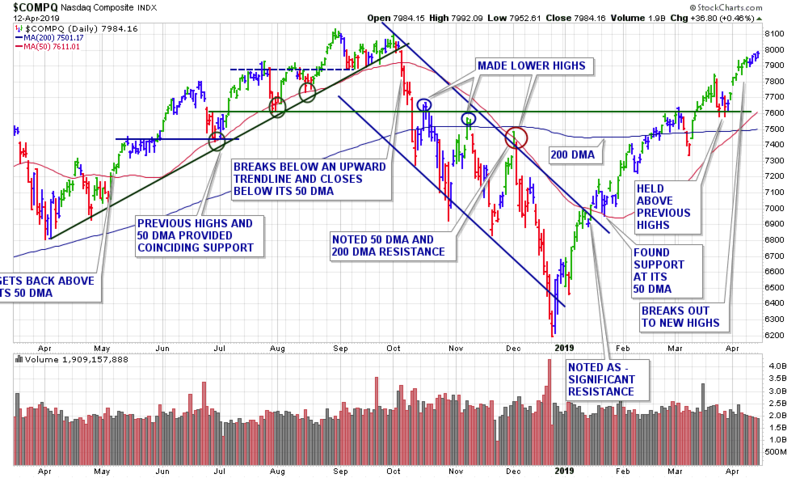 The tech-centric index ended the week within -20 points from the round-8000, at 7,984. The S&P 500 index added another +14.67 points or +0.5% this past week, closing at 2907.41. The Cboe Volatility Index touched its lowest level in six months on Friday. I ran my routine stock screens this weekend and added 3 new stocks to our watch list. Futures are sharply higher this morning with the Dow’s up well over +200 points. European and Asian markets are mostly lower. JPMorgan Chase (JPM) and Wells Fargo (WFC) are set to report results before the opening bell. Shares of DECK which is on our Technical SetUps WatchList broke out above their TRIGGER PRICE yesterday. Volume was, however, below average being off by -13%. There are a total of 16 stocks on our watch lists. – see here. On Wednesday, the Dow Jones closed flat while the S&P 500 added +0.4% and the Nasdaq gained +0.7%. This morning, European markets opened mixed, following a downbeat trading session in Asia. Yesterday, we had a solid breakout in FTNT which was on our TrendLine SetUps WatchList. Shares traded above the posted TRIGGER PRICE of $88.70 was volume was above the TRIGGER VOLUME. This stock was just featured in yesterday morning’s report. Yesterday, the S&P 500 closed +0.1% higher, just enough for an eighth consecutive positive session. The Nasdaq gained +0.2%, while the Dow was weighed down by Boeing and finished +0.3% lower. This morning, European markets opened mixed as stocks in Asia also struggled to find direction. The United States is threatening tariffs on $11 billion worth of European goods, a move that could escalate tensions between the trade partners. The International Monetary Fund will release its latest World Economic Outlook at 9:00 a.m. ET. Then at 10:00 a.m., the U.S. Bureau of Labor Statistics will release a report on the jobs market in February. 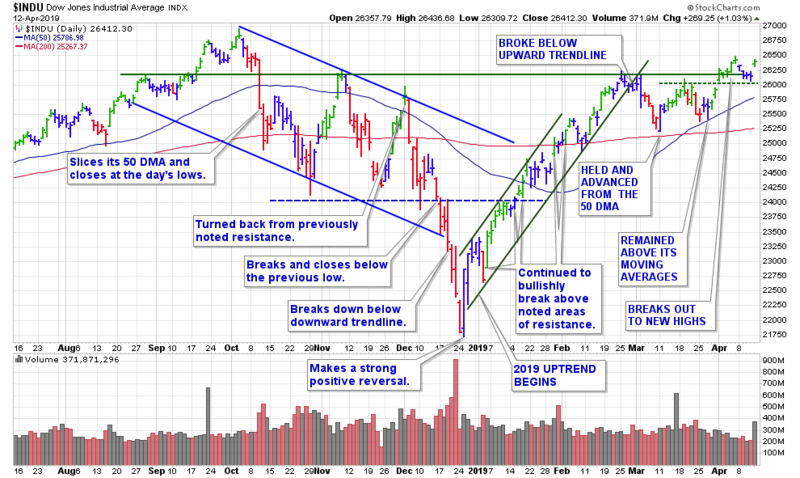 On Thursday, the Dow Jones closed up +0.6% while the S&P 500 added +0.2% and the ended Nasdaq flat. This morning futures are higher as European markets opened mixed, following a mostly positive trading session in Asia. The US economy added 196,000 jobs in March, a recovery from an unusually slow jobs market in February, according to official data released Friday. The jobs number was slightly higher than expectations. The unemployment rate remained at 3.8%. In February, the economy added only 33,000 jobs, the fewest jobs added since September 2017. Also of note, President Donald Trump on Thursday hinted the United States and China may be inching closer to finalizing a deal to end a year-long trade impasse. There are a total of 18 stocks on our watch lists. – see here.